I mentioned in my last post that I’d become intrigued with urban sketching. Until a few weeks ago I’d never heard of it. 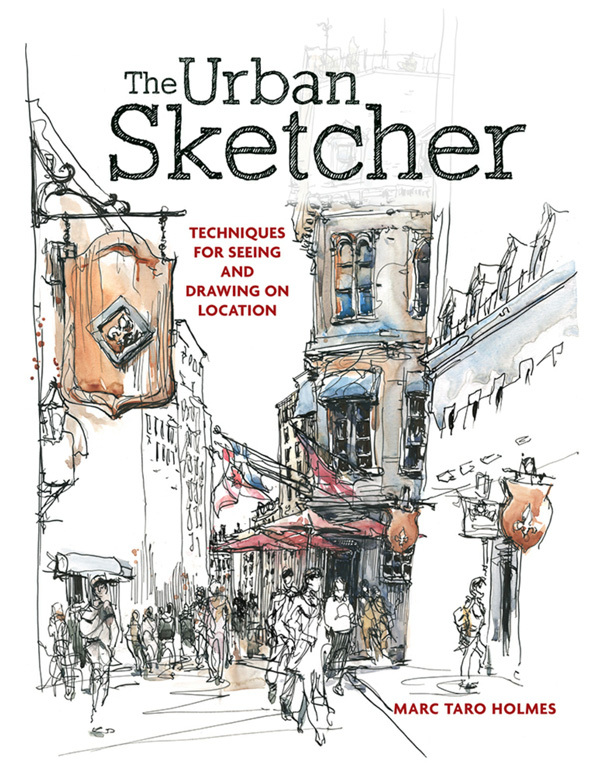 I was searching on Amazon for things that might help me tackle plein air painting in urban settings and ran across a book called The Urban Sketcher by Marc Taro Holmes. I bought the Kindle version and read it cover to cover in just a few days. I subsequently also bought the paperback version because it’s one of those books I may want to use for more extensive study. I learned that urban sketching is actually a worldwide movement of artists who go out and capture images of the world with sketches rather than a camera. Most use pencil, ink and watercolor, but some use other media. 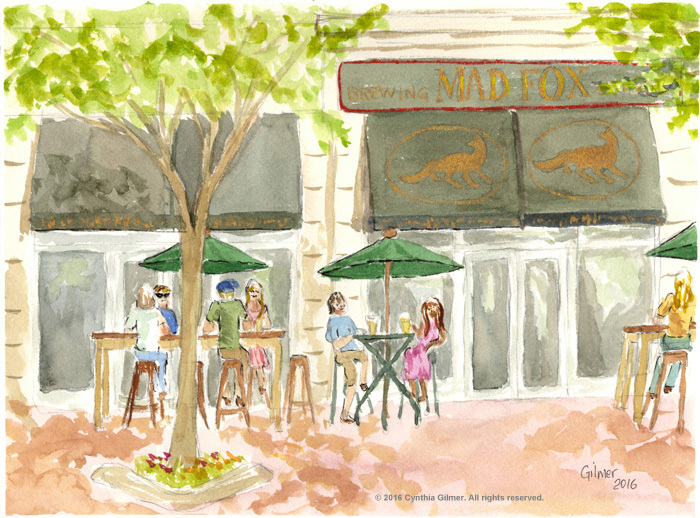 There’s a website, www.urbansketchers.org, where people post their work. Marc Taro Holmes also has a blog called citizensketcher.com. 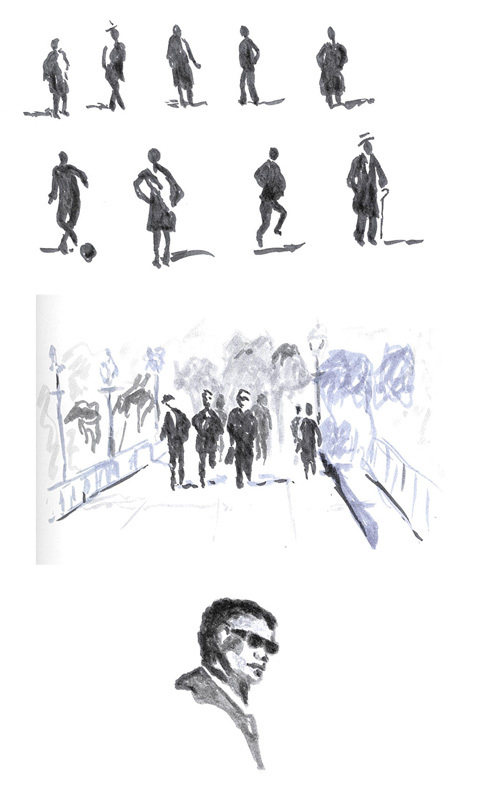 Mr. Holmes is a Canadian from Montreal who seems to be one of the premier urban sketchers. His sketches are beautiful. He used a three-pass technique for doing his watercolors called tea, milk and honey. Tea represents the light washes done in the beginning. Milk is adding the details, and honey is adding the bold colors that really make it pop. Sounds simple, right? NOT! I tried to incorporate what I learned in my plein air paintings, and while the results were better than they would have otherwise been, I still have a long way to go. Another aspect of Mr. Holmes’ technique that I struggled with is that he inks before he paints. On one level I like this idea. If you think about it, it’s kind of like creating a coloring book. In execution I found that I over inked in places and of course, watercolor doesn’t cover up ink. That said, I see that some urban sketches have a lot of ink showing through, so maybe I’m just over sensitive to it. Still, I like softness in some things that over inking doesn’t support. One of the things I really struggle with in urban scenes is the people. Mr. Holmes talks about doing composite sketches of people in his book but its easier said than done. I went looking for more specific instruction on this and found a recently published book called Sketching People by Lynne Chapman, also an urban sketcher. While this is an excellent book, it is primarily about sketching faces and details. I really need the form and function side of things to capture the feeling of a cityscape. Detailed faces aren’t important. I just started another book called People in Watercolour by Trevor Waugh. This one is also a Kindle book that is not available in paperback through Amazon. It may be out of print. I’m still evaluating this one, but I’ve had some fun doing some simple exercises drawing silhouetted forms. It’s good practice. I want to see how well I can translate it into real world situations capturing real people, rather than imitating the sketches in the book. Here are a few from my early practice. I actually used brush markers to do this. I’m sure it will be much harder when I try it using watercolor. 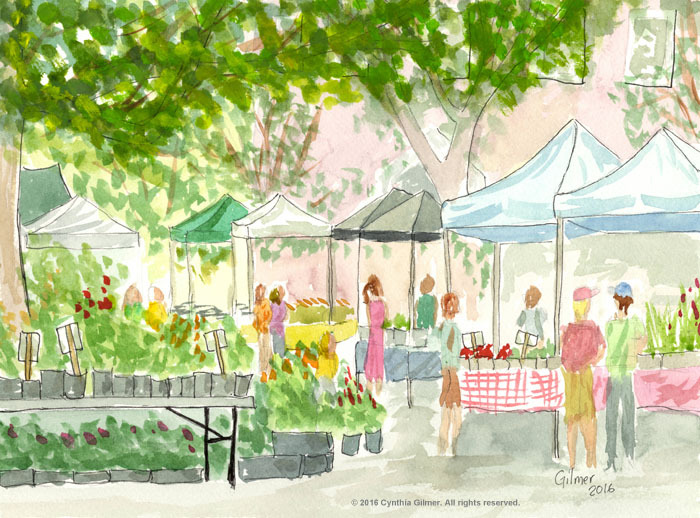 Today was the opening of Scenes in the City, Falls Church Arts’ annual Plein Air Festival. The painting period is from mid April till mid June. To qualify the works must be painted on location and within the City of Falls Church. No painting from photographs is allowed. This was a particularly tough year because it has been so rainy all spring. That coupled with the fact that we are only in Northern Virginia every other weekend made it a real challenge for me. I managed to enter two works, both painted on the same Saturday two weeks ago. This show takes me out of my comfort zone. I am at my best painting landscape paintings, in oil, in my studio, from photos I’ve taken. I am trying to do more plein air because the colors are never right in photographs and the scene is also flattened. That said, plein air is hard and can be unforgiving. You have to paint the whole painting in one sitting. You’re dealing with the elements, and curious people, and other distractions. To add to that, Falls Church is an urban area, so I’m painting cityscapes with buildings and people, which is very different from my mountains. And if that’s not enough, I decided to do them in watercolor this year. (See my last post for my thoughts about watercolor.) Watercolor is more transportable and quicker than oil, but I’m still learning to use it. The show was wonderful. I felt very humbled when I saw the quality of the other works this year. I did not feel like my paintings held up in comparison. I did sell one of them, so I’m pleased that someone likes my art. Perhaps I judge myself too harshly. It was fun to be part of the show, which opened at the Falls Church Farmer’s Market. We had great traffic – I think about 175 people voted for the people’s choice award. This is very good for creating awareness of our little Falls Church Arts community. My two entries are pictured below. Just prior to painting these I read a book called The Urban Sketcher, which will be the subject of a future post. I was doing my best to use what I learned from that book. 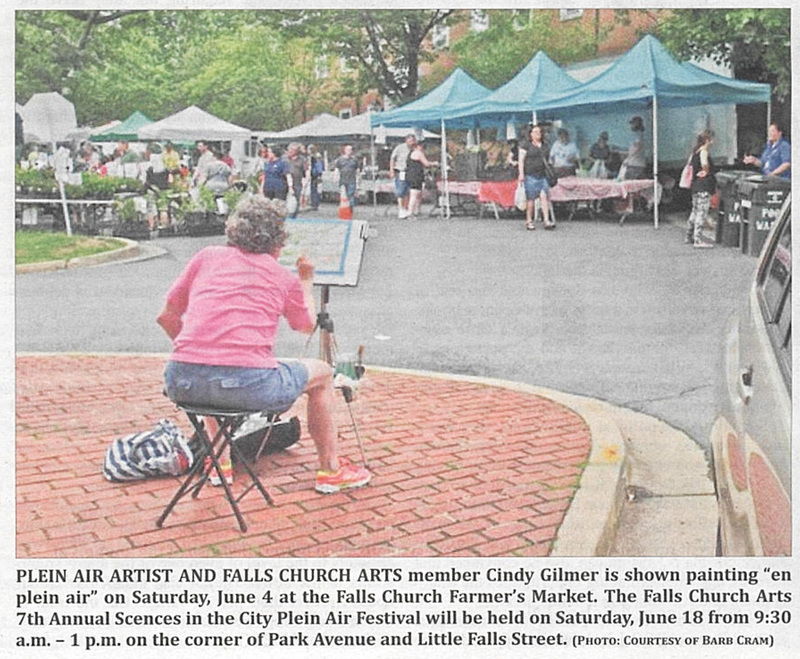 Finally, in case anybody doubts that I really painted these outside, a very unforgiving photo of my backside appeared in the Falls Church News Press this week. I was so engrossed in painting my market scene I didn’t even know I was being photographed. If I had, I would have tried to strike a more flattering pose. The show will be hung in the Kensington Senior Living Sales and Information Center at 1212 W Broad Street until July 11th. Then they will be moved to Art Space at 410 S Mable Avenue later this summer. Finally it will be moved to the Falls Church City Hall. All locations are in Falls Church City, Virginia.